The 612-page manual for Scientologists written by L. Ron Hubbard contains instructions for the eight different Operating Thetan levels including 'clear' and OT8. Most of the manual is typed from a computer, while the packet contains some hand written notes by Hubbard himself who also signed them. The manual also contains letters by Hubbard to individuals who have passed the according levels. "One: Walk around and counts bodies until you have a cognition. Make a report saying how many you counted and your cognition. Two: Note several large and small female bodies until you have a cognition. Note it down. Three: Note several large and several small male bodies until you have a cognition. Note it down. Four: Final a tight packed crowd of people. Write it as a crowd and then as individuals until you have a cognition. Note it down. Do step over until you do." Hubbard then goes on to explain OT2, but before he does so, he tells the Churches how to keep Scientology working. One way is to not divulge information on their "technology." Doing so, says Hubbard, would result in "the complete destruction of all our work." "On the other hand there have been thousands and thousands of suggestions and writings which, if accepted and acted upon, would have resulted in the complete destruction of all our work. Our technology has not been discovered by a group. True, if the group had not supported me in many ways, I could not have discovered it either. But it remains that if in its formative stages it was not discovered by a group, then group efforts, one can safely assume, will not add to it or successfully alter it in the future," states Hubbard in a confidential letter dated February 7, 1965. Hubbard also goes on to say that "man has never before evolved workable mental technology and emphasizing it is the vicious technology he did evolve—psychiatry, psychology, surgery, shock treatment, whips, duress, punishment, etc., ad infinitum." Hubbard also says that "war, famine, agony and disease has been the lot of Man" and that Man "has been what has made Earth a Hell—and if you were looking for Hell and found Earth, it would certainly serve." Hubbard calls those 'men' "SP Body Thetans" or those who "are out of valance" and who are "stuck to another thetan or body but is not in control" with Scientology. Some he says are even "psychotic, serve faces and have fixed ideas" which "inhibits recovery." Thetan is derived from the Greek word "Theta" which means "thought or life." "An individual being such as a man is a thetan, he is not a body and he does not think because he has no brain," states Hubbard. It is not until 'OT3' when you learn the true beginning of Scientology. In Hubbard's own hand written notes, he begins to describe a series of "76 planets [orbiting] around larger stars founded 95,000,000 years ago" which he says "are visible from here [Earth]." From those planets, which were over populated by "about 250 million per planet," came a "head of the Galactic Federation" named 'Xenu' who solved the overpopulation by sending mass amounts of his people to Earth somewhere between "75,000,000 and 4 qadrillion [sic] years ago." Hubbard says that he brought them to Earth and dropped them off inside volcanoes on an island he describes as Hawaii in the Pacific Ocean. Xenu then captured the ones who escaped after 36 days and exploded the remaining individuals with a hydrogen bomb. Xenu was later "captured after six years of battle" and Earth had since become a "desert." It is also said at this level, an implant, in what Hubbard calls an "engram" will be given in which the individual can "see pictures." However these pictures are not to be "stuck" or permanent. At 'OT4' individuals are allegedly rid of illegal and legal drugs. Documents state that addicts are not treated with drugs, but simply not given anything. "As drugs and drug incidents have been so common on the whole track, to simply generally ask for drugs or drug incidents when dealing with BTs and clusters, could cause a total restim," states the document which then says that individuals are made to wait out the effects of the drugs. Another process used to try and stop drug use is to "take any previously given Drug somatic items, or newly list any additional items connected with reading drugs, medicines, etc., and assess for reading somatic item." Hubbard insists that these methods are proven effective. 'OT5' is when individuals learn about the "physical universe, not the laws of physical scientists, but the basic considerations about Matter, Energy, Space and Time," states Hubbard. At 'OT6' you allegedly learn telepathy and 'OT7'is the "rehabilitation of ability to project intention." The final level, 'OT8', you are to "have full certainty and, therefore, perception on all" of your issues. According to Hubbard, the 'OT8' manuals are supposed to stay aboard the Free Winds Scientology ship which has heavy security because nothing is supposed to leave the ship. Despite that, Hubbard himself claims to have smuggled out his own 'OT8' instructions for the "elite" Scientologists. "I am breaking security as I disagree that this should only be released to an elite in Scientology. I do, however, ask it not be released to psyches or 'squirrels' or anyone who will break the Independent Security Network and allow it to get back to the Church of Scientology. It would be best if they do not find out that we have it. Please treat this data responsibly. It is the key to the only truth possible," said Hubbard in regards to his 'OT8' instructions. Wikileaks previously leaked documents relating to the Church of Scientology's division the Office of Special Affairs. 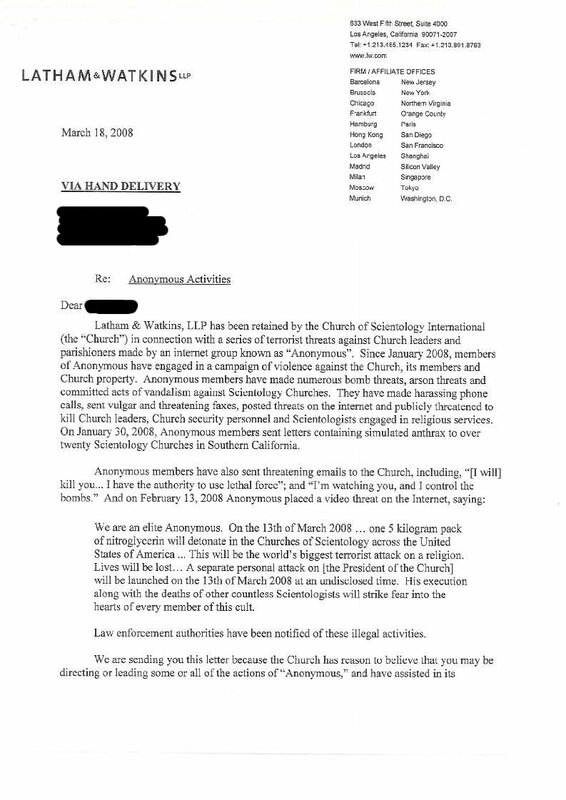 The 208-page document released March 9th details Scientology's involvement in black propaganda according to its "Fair Game" practices. David J. Schindler, was sent to one member with the charge of terrorism. This Saturday huge number of protesters will convene at the Lincoln Memorial in Washington, DC to protest Scientology. This event will draw protesters from all over the country, and will be larger than any of the single local protests that have been happening up to this point. I've been to the Church of Scientology and IT IS NOT WHEELCHAIR accessible. But the folks are nice.